New Delhi, Oct 19 : Nagaland Chief Minister Neiphiu Rio said if physical integration of contiguous Naga-inhabited territories is not possible, there should at least be emotional integration to resolve the Naga insurgency. Perhaps, Rio has in mind a body that unites the Nagas irrespective of which state they live while thinking aloud of an emotional integration. Already, there is the Naga Ho Ho, an apex tribal council where various Naga tribes are represented. Last month, a Naga Ho Ho delegation met various political leaders here for a peaceful solution. While working out a solution, the government could mull institutionalizing the Naga Ho Ho, said a source drawing an analogy with the SGPC that unites Sikhs in matters of religion. Peace talks began with the NSCN (IM) 15 years ago. In the last two years, interlocutors led by 1972 batch IAS officer R S Pandey could impress upon the rebel leaders that though the Constitution allows redrawing state boundaries for Naga integration, it is fraught with practical problems. Also, India won't agree to "secession of an inch of its territory". There are indications that the rebels have understood India's imperatives. For an "honourable settlement" of the issue, the Centre can concede certain special rights in governance and development relating to Naga identity, culture, land and autonomy, said a source. The Centre is also mulling autonomous councils in Naga inhabited areas in Manipur and Arunachal Pradesh like those for Bodos in Assam or Gorkhas in West Bengal, said a source. For this, skilful negotiation in a short time between the Centre, concerned states, interlocutors and the Nagas is required for a win-win solution acceptable to all. "The solution should be inclusive," said Rio. He insisted this is the most opportune time for the Indian government to resolve the "Naga political issue". "The people of Nagaland want peace. They are fed up with extortion and illegal activities. 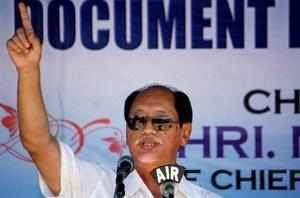 The Naga nationalist underground groups have never come as close to the state and central government as now," he said. Leader of Naga insurgent group NSCN (IM), Th Muivah, too, is ready for settlement. Rio said this was the most "opportune time" for the Centre to come up with a permanent solution to the 65-year-old struggle. "If this opportunity is missed, I don't know whether we will get such a chance in our lifetime," said Rio. For an embattled UPA government suffering from policy paralysis, it seems to be an uphill task.